Some of the greatest artists of all time responded with passion and creativity as their beloved Paris was transformed by the modern age. Now, a major new exhibition developed by the Art Gallery of Ontario is the first to explore themes of industry and labour in Impressionist and Post-Impressionist art. 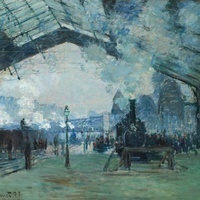 Impressionism in the Age of Industry: Monet, Pissarro and more brings masterpieces from around the world to the AGO, including great paintings, sculpture, drawings, prints, photographs and film from the period. The exhibition also presents works from the AGO Collection in a new light, including Camille Pissarro’s Pont Boieldieu in Rouen, Damp Weather, Claude Monet’s Charing Cross Bridge, Fog, Edgar Degas’ Woman at Her Bath, and James Tissot’s The Shop Girl. Looks like a very exciting event. Thank you for posting this. I wish that this exhibit would travel to Jacksonville Florida where I am !! http://WhiteCollarRentals.com . . . .currently warm but NO Art ! !